Families exiled from the Chagos islands in the 1960s and 70s to make way for a US Indian Ocean airbase have won a new victory in their long fight to return. The UK High Court ruled in their favour in their battle to prove they were illegally removed by the UK government. 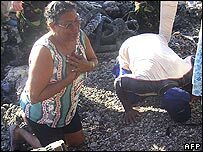 The leader of the Chagos Refugee Group, Olivier Bancoult, told the BBC it was a "special day, a day to remember". But the government was given permission to appeal, and the islanders must also overcome UK and US residence vetoes. 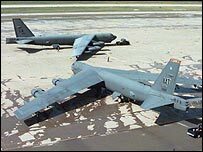 Lawyers for the islanders had argued that though they could not live on Diego Garcia - which houses the US airbase and is the largest of the 65 Chagos islands - they should be allowed to return to the others. Some 2,000 residents of the British territory - who mainly worked on coconut plantations - were removed when Britain leased Diego Garcia to the US to use as a military base. At the High Court, Sir Sydney Kentridge QC had described the treatment of the Chagossians as "outrageous, unlawful and a breach of accepted moral standards". He said there was no known precedent "for the lawful use of prerogative powers to remove or exclude an entire population of British subjects from their homes and place of birth". But John Howell QC, appearing for the Foreign Office, argued the government acted within its powers, and did not accept that any residents of the territory were unlawfully removed or excluded in the period 1965-1973. The local Ilois people, he said, who left the islands and re-settled in Mauritius, received compensation that eminent English lawyers described as fair. Mr Bancoult, celebrating the court's decision in the islanders' favour, told the BBC News website: "We have won a historic judgement in our favour to allow us to return to our homeland. "Our next step is that we will go to our birthplace as soon as we can. The right of the people who have been banished for so many years has been returned." This is the second time the islanders have won a ruling that their eviction was unlawful. In 2000, the High Court ruled that a 1971 Immigration Ordinance banning people without permits from entering or remaining in the colony was unlawful. But in 2004, the government changed the procedure under which the eviction was ordered, using its so-called royal prerogative to establish an Order in Council. It is this Order in Council - in essence a government order - which the islanders have now had declared "null and void". BBC News website world affairs correspondent Paul Reynolds says the islanders still have to overcome the hurdle of the agreement between the UK and the US under which each side has a veto on who should live in the whole Chagos archipelago. The US says it opposes any return on security grounds. Richard Gifford, the islanders' London lawyer, said that the judgment stated that the US needed only the main island Diego Garcia for a base. "This should help the UK to say that the Outer Islands can be recovered for occupation," he told the BBC. Recently, Jack Straw - then foreign secretary - said that a return to these islands was not "practical". A British study on a potential repopulation of the outer islands concluded that life there wolud be precarious. The British government has not wanted to commit itself to the expense either. But Mr Bancoult on Thursday warned the US and UK to "look carefully at what to do". "The Chagossians are willing to co-habit with the Americans but they have never shown an interest in that," he said. "Now they should look forward to respecting the fundamental rights of people to live in their birthplace... It's a pleasure to succeed against such adversity," he said.